I didn’t know what to expect when I was invited for the World Journalists Conference 2015 for The 70th Anniversary of National Division: Think About Unification on the Korean Peninsula by the Journalists Association of Korea (JAK). I knew a little about the country from the events and exhibitions I had been covering at the Korean Cultural Centre in Delhi which was more about cultural exchanges and the youth-targeted musical wave K-Pop. I thought that there would be a lot of dialogue and experts speaking. But the one week in South Korea turned out to be a delight. There were dialogues, seminars but an amazing introduction to the country which was the world’s 11th largest economy by 1995. The peninsula has been inhabited since the Paleolithic age. But during modern times, Korea had a turbulent history with war for freedom from Japanese rule in 1945 and then division between the north and the south after a civil war in 1950-53. Our guide, Ok Sun Park (which means as beautiful as a jade), informed that the government had to borrow from the IMF to build the nation after the Korean War. And the citizens helped by giving up their gold ornaments to the government which helped it return the loan and make it a bustling economy. Landing at the Seoul-Incheon International Airport, I realized why it was labeled as the world’s fourth largest metropolitan economy with a GDP of US$774 billion in 2012, after Tokyo, New York City and Los Angeles. It’s also known as the Miracle on Han River after its transformation from the damage of the Korean War. Well, the drive in the Limousine Airport Bus was a treat to the ‘miracle’ as we crossed a camping site. It was Sunday and the camping site was full of people. Some using bicycles on the tracks, others were taking their speed boats back while more were eating in some areas. 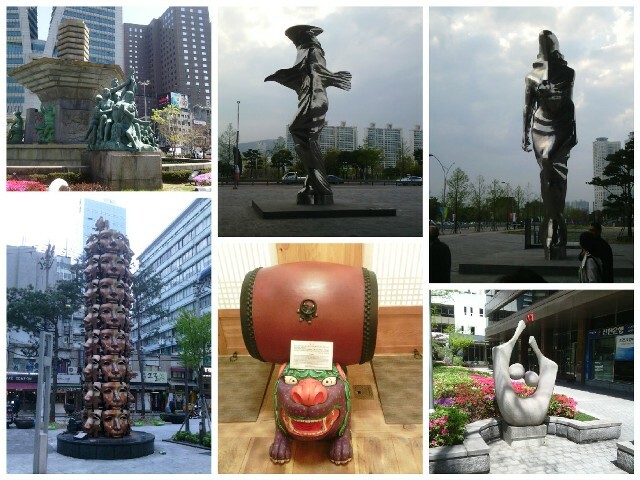 Seoul is an art lover’s delight and an architect’s study. Though it is densely populated, the roads are wide and the buildings high. 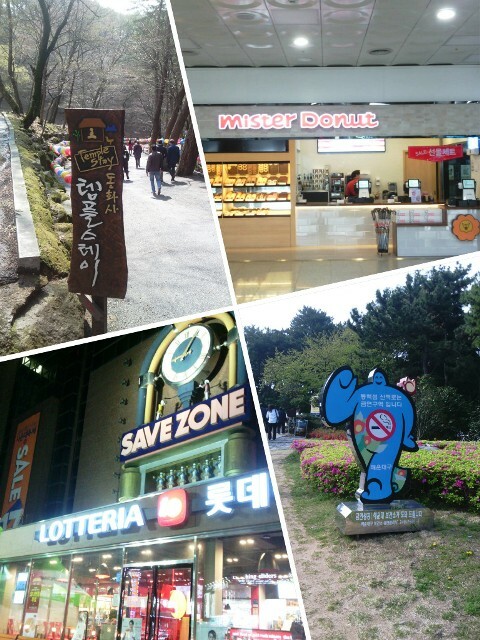 But this modernity, hygiene, cleanliness, culture we saw across the cities of Daegu and Busan too. Koreans have a lot of national pride and there are hardly any incidents of tourists being cheated or harassed. Business, discipline and aesthetics blend in well. I could actually call them timekeepers of the world, as even the delay of seconds is frowned upon. Keeping our luggage, we began the hunt for lunch and found a lot of sea food—it was my introduction to the world of octopus, crabs, whelks, sea fish, king prawns, lobsters, eels. I am not a heavy meat eater and Koreans love beef and pork. So if you are a vegetarian, you do find pancakes and pizzas, but carry some dry food with you. But you get an amazing array of fruits and fresh juices. Do try those, for the vendor makes the juice right in front of you. Coffee is the preferred drink, and every second shop is a coffee shop. But I liked the ginseng tea which is of two kinds–red and white ginseng. The ice cream in a cone is actually a huge helping fit for two; I kept wishing someone would share it with me. Soju is a popular wine and beer is another popular drink. Koreans eat with steel chopsticks and spoon. Eating with steel chopsticks was quite an experience as the food slipped around the plate and even on to the table. But I did manage to win my battle with the chopsticks by the end of the week. A dish you will always find on the table is khimchi which is kind of a spicy pickled cabbage. Korea loves technology and smartphones. The best part is that you get wi-fi all over, even on the streets and it’s fast. We got to experience speed with a ride in the monorail in Daegu and the journey from Busan to Seoul in KTX—bullet train. Each city boasts of a state-of-the-art convention and business centre. 1. Art lover’s delight Sculptures emerge at different corners and crossings. They are modern, yet aesthetic, blending into the city’s ambience. Nothing is ostentatious but very versatile and eye-catching. For instance, the ladybird outside Busan’s International Cinema Centre is actually a sea gull as that is the bird for Busan. The city is also known as the country’s film making centre. 2. Beauty conscious The country is on a rapid green growth project and the streets are lined with flowers and trees. Cherry blossoms bloomed. 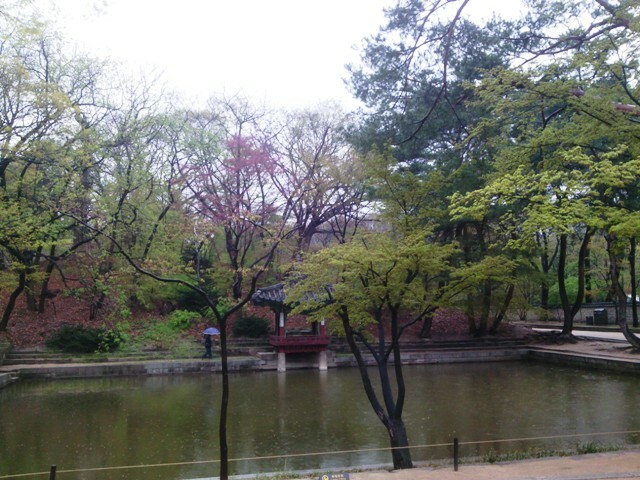 My introduction to these beautiful trees happened at the Changdeokgung Palace which is a UNESCO World Heritage site. This was the second palace built in 1405 during the Chosun Dynasty rule. It means ‘prospering virtue’, and replaced the Gyeongbok Palace amidst struggle over the throne. It was burnt during the Japanese invasion but rebuilt in 1609. The Secret Garden at the rear is a must-see as it has one of those fairy tale movie sets kind of feel to it. Ticket for an adult is Won 3,000. 3. Fast moving transport Even though the country has good highways and excellent buses, the monorail in Daegu will make life much easier for its citizens. The bullet train makes it convenient for traveling long distance. I was told that the drive from Busan to Seoul takes about five hours and the train took 2.30 hours. There are first class and economy class compartments in the train. And it’s a left-hand drive country. 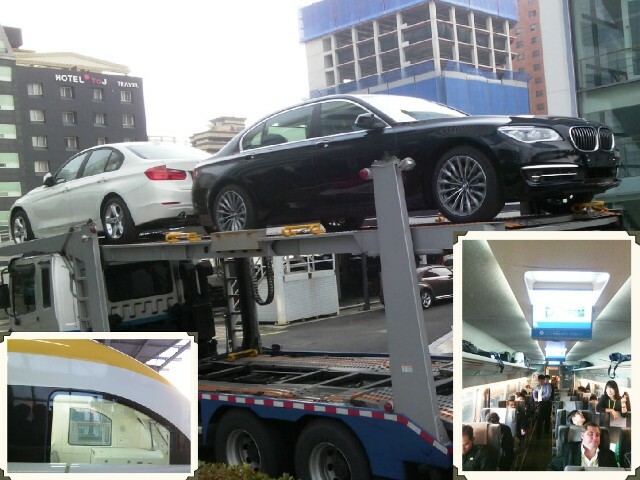 Automobile major Hyundai rules the roads but there are cars from Europe too. This makes it a tourist’s dream. The signs are a visual delight. There is a picture, name in Korean as well as English. You will even find the distance from one place to another on some signs on the road. If you get lost, just find your way to the nearest subway, and there will be a map to guide you. 5. Donghwasa: Buddhist spirit in the mountains Half the population does not follow any kind of religion and rest are divided between Buddhism and Christianity. 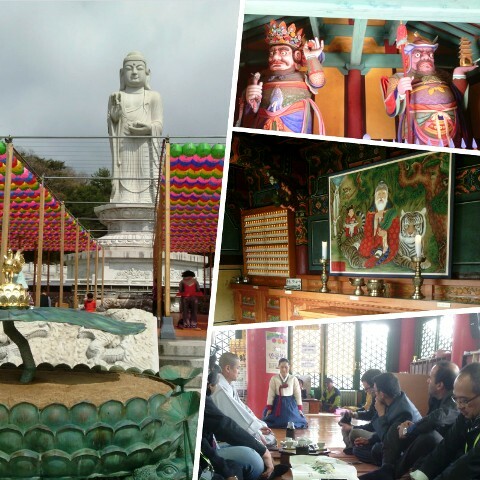 Though we did not visit any church, we did see the Donghwasa, also Donghwa Temple, of the Jogye Order in northern Daegu. Located on the south side of Mt. Palgongsan it means ‘temple of paulownia blossoms’. This was close to heaven, far from the madding crowd and has a natural spring flowing through, just the place to forget the world and relax. Monk Hye Min gave us a tour of the Buddhist seat. A lesson he gave in one line—nothing is permanent so we must live in peace and harmony. He calls the statue of Buddha—the Buddha of Unification. The first temple was built by monk Geuk-Dal in the 15th year of the Silla King SoJi’s reign (493) and named Yugasa (Yuga-Temple). Donghwasa was applied after its reconstruction under King HeungDeok during the Unified Silla period in 832. Then it was time to learn the art of drinking tea, monk style. This is a special ceremony where we were taught the traditional Korean way of greeting and how to make and serve the tea. This is a serious ceremony which is focused on inculcating concentration and encouraging calming thoughts and habits. It would cost around $25 per person. We even got the coaster as the memento. 6. Waves of Busan The city where ships live, it’s one of the major ports in the country. It is also the city where most Koreans had found shelter during the Korean War. 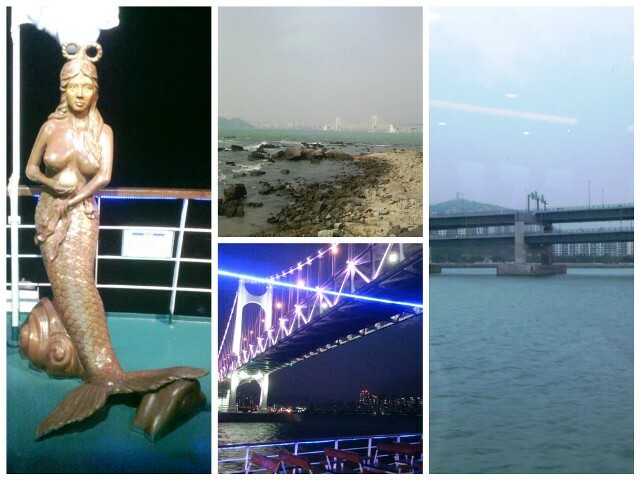 Busan played host to the 2002 Asian Games and APEC 2005 Korea. It was one of the host cities for the 2002 FIFA World Cup, and is a center for international conventions. Lucky to be staying at Haeundae Grand Hotel, we walked on the beach at the night, watching the lights of the ships flickering in the dark. Our day had begun with a tour of the Nurimaru APEC House where you get an idea of the Korean way of life, as models show the life. Then it was time to visit BEXCO, the exposition and convention centre and finally a tour of Busan Cinema Centre which even has an outdoor theatre for movie screenings. Busan is also the movie hub of the country with many production studios. Dinner for us was normally between 6-8 pm and this evening was spent on a cruise, eating the delights and experiencing the waves, watching the bright night lights of the bridge and the city. 7. 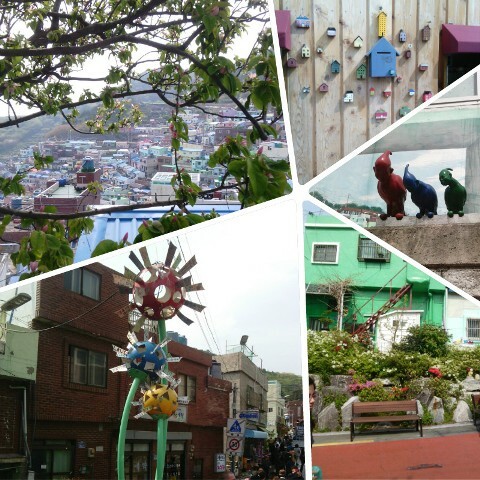 Gamcheon Culture Village Some call it the Korean Machu Pichu, others refer to it as Santorini of Korea as the small, hillside houses overlook the ocean. A refuge for the people who fled to Busan during the Korean War, it has now become an arty, cultural hub. 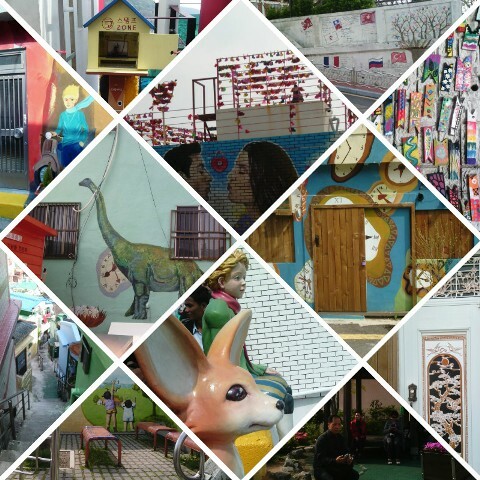 Tired of living in the ugly, matchbox houses, the people of this village gave it a face lift by giving them an art form. The houses still have residents. 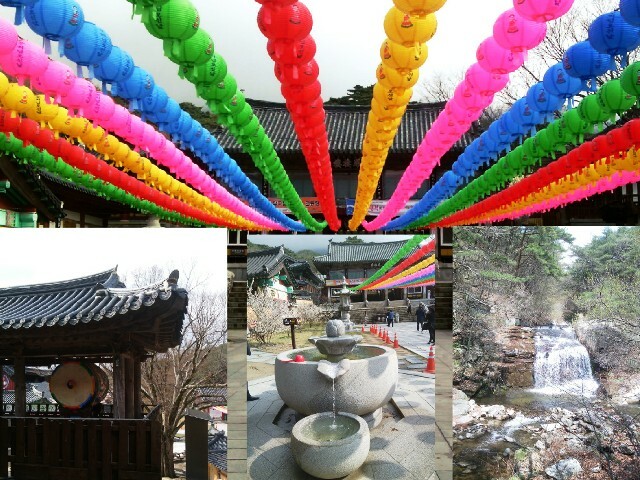 Delving into the history, I discovered that in 1958 around 4,000 Taegeukdo believers made it their habitat. This religion believed in the “yin and yang” (on the Korean flag), symbolizing the balance of good and evil. The houses are built in tiers so that not a single house blocks the view of the house behind it, sticking to the Taegeukdo teaching of allowing everyone to prosper. The narrow alleys and craft shops make it a quaint yet exciting outing. 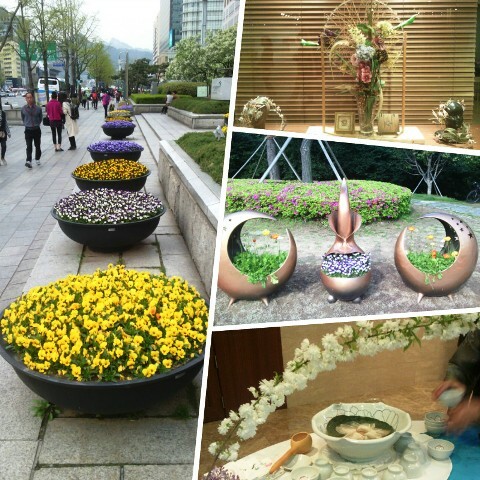 It is just an hour’s drive from Haeundae in Daegu but you need to spend time absorbing the ambience. There is a museum and you can take guided tours, or simply buy a map for Won 2,000 and see it all by yourself on foot.